For other uses, see Journey to the Center of the Earth (disambiguation). Journey to the Center of the Earth (also promoted as Journey to the Center of the Earth 3-D or Journey 3-D) is a 2008 American 3D science fantasy adventure film directed by Eric Brevig and starring Brendan Fraser, Anita Briem, and Josh Hutcherson. It is an adaptation of the Jules Verne novel (which had previously been adapted multiple times, most notably in the 1959 film of the same name), and was released in 3D and 2D theaters by New Line Cinema on July 11, 2008. The film received mixed to positive reviews from critics and earned $242 million on a $60 million budget. Max Anderson (Jean-Michel Paré) is being pursued by a Tyrannosaurus until a fissure vent opens in the ground. When he tries to jump across, he calls out his brother's name before falling into the vent. Ten years later, Max's 13-year-old son, Sean Anderson (Josh Hutcherson), visits Max's brother, volcanologist Trevor Anderson (Brendan Fraser). In a box of items that belonged to Max is a book, Journey to the Center of the Earth by Jules Verne. Notes written by Max are found inside the book. In Trevor's volcanology laboratory, a device shows activity on Snæfell, a dormant volcano in Iceland. Trevor and Sean travel to Iceland to investigate. They try to contact Icelandic volcanologist Sigurbjörn Ásgeirsson, but instead encounter his daughter Hannah Ásgeirsdóttir (Anita Briem) since her father had died some years earlier. It turns out that Sigurbjörn and Max were both Vernians, a group of people who believe the works of Jules Verne to be fact and not fiction. Hannah offers to help them climb the volcano. While the group is hiking up the volcano, a lightning storm forces them to take shelter in a cave. The cave entrance collapses, trapping them in what appears to be an abandoned mine. The trio rappel down a giant hole and ride on out-of-control mine carts, in which the tracks start to branch off in three ways. Hannah and Trevor save each other from dead-ends and Sean reunites with them. They reach the bottom of a volcanic vent filled with different varieties of crystals, including Diamonds. Sean accidentally drops a diamond, which breaks the Muscovite floor, and they begin to fall towards the center of the Earth. The vent eventually becomes a water slide which drops them safely into a lake in the center of the Earth, which turns out to be a completely separate world contained within the Earth. The group starts seeking a way back to the surface. Along the way, they find evidence that someone had been there a hundred years ago. Trevor remarks that some instruments found are Lidenbrock's (the name of a character in the book), suggesting that another group had previously made the journey, somehow returned to the surface and recounted the tale of their adventure to Verne. They find a large tree with some of Max's things inside of it. While Trevor and Sean are examining what they've found, Hannah finds Max's body. They bury Max on the beach of the underground ocean and Trevor reads a letter to Sean found in Max's journal. Trevor discovers that his brother died due to dehydration because of hot magma surrounding the center of the Earth. Using information from Max's journal, Trevor determines that they must find a geyser that can send them to the surface before the temperature rises to 200 °F. Further, they must reach the geyser within 48 hours or the water for the geyser will have evaporated. They build a raft and begin crossing the underground ocean, but soon are attacked a pack of Xiphactinus, until a pod of Elasmosaurus devour the Xiphactinus, allowing the trio to escape. The raft's sail becomes loose. Sean tries to hold on, but is blown away and separated from the two adults. Sean wakes up on a beach and a little Bio-luminescent bird guides Sean towards the river. Meanwhile, Trevor and Hannah decide to take a rest, but are attacked by Carnivorous Plants. Hannah is captured and strangled by a plant. Trevor battles the other plants and rips the plant, that is holding Hannah by the neck, out of the ground, and they continue towards the geyser. When they arrive at the river, Trevor calls out to Sean but gets no response. Trevor says he is going to look for Sean, but tells Hannah she should continue on to the geyser and save herself. Before he goes, Hannah kisses Trevor in case he does not return. Meanwhile, Sean has entered an arid, bone-filled area. He then encounters an enormous Albino Tyrannosaurus Rex, which upon seeing him, begins to chase after him. As the Tyrannosaurus chases him, Trevor hears Sean's screaming and breaks the wall separating them, the dinosaur breaks through the wall and chases them but Trevor sees and runs for a Muscovite field, the Tyrannosaurus follows him, as ground collapses under its footsteps and falls into the dark sinkhole. When they get to a river, they find Hannah sailing a boat fashioned from the top jaw of a carnivorous dinosaur. They sail to a volcano with magma rising in its crater, and find out they missed the geyser. Sean notices that the crater walls are wet. Trevor hears water flowing on the other side of the walls and sees that the crater walls contain magnesium. After he uses a flare to ignite the magnesium, the resulting water-magma collision triggers the geyser, shooting them up and out of the center of the Earth through Mount Vesuvius. When they fall, they accidentally destroy some of the vines in a vineyard. To make amends with the vineyard's farmer, Sean gives the owner a diamond that he found while in the center of the Earth. Trevor sees that Sean has many more diamonds in his backpack. After the adventure, Sean visits Trevor and Hannah in their new home, purchased using some of the diamonds Sean took from the cave; Trevor is also using them to fund his late brother's laboratory. Trevor hands Sean a book about another strange land, Atlantis: The Antediluvian World by Ignatius L. Donnelly, and suggests they get together during Sean's Christmas break. Sean reveals that he has brought the little bird back from the center of the Earth to keep as a pet. However, the bird happily flies away. On September 22, 2001, Walden Media announced that Eric Brevig was hired and set to direct Journey to the Center of the Earth based on the book of the same name by Jules Verne. Michael D. Weiss, Mark Levin and Jennifer Flackett wrote the script for the film. Beau Flynn and Charlotte Huggins produced the film with the budget of $60 million for release in 2008. On April 16, 2003, it was announced that Brendan Fraser, Anita Briem, Josh Hutcherson, Seth Meyers, Jean-Michel Paré, Jane Wheeler, Giancarlo Caltabiano and Garth Gilker joined the film. On 9 December 2005, it was announced that Andrew Lockington would compose the music for the film. On March 2006, development and filming of the film was completed in Canada and Iceland. On April 20, 2006, principal photography and production began. On January 2, 2007, New Line Cinema acquired distribution rights to the film. Journey to the Center of the Earth was filmed in 2006. The film transposes the novel into the present day and is mostly live action, with only the landscape and creatures supplied by computer-generated graphics. The film is projected using Real D Cinema and Dolby 3D. Josh Hutcherson's character, Sean, is named after the professor and conservation biologist Dr. Sean Anderson. The first trailer was shown before screenings of Meet the Robinsons, the re-release of The Nightmare Before Christmas and the release of Beowulf, with the Hannah Montana & Miley Cyrus: Best of Both Worlds Concert, and during the 2008 Kids' Choice Awards. Warner Bros. marketed the film like a theme park attraction. However, the studio had to slightly tweak the campaign (including dropping "3D" from the title) when it became clear that the film would be shown in 3-D in far fewer theaters than anticipated. In May 2009, the film premiered as "Journey to the Center of the Earth 4-D" at Stone Mountain Park in Georgia. It also opened in the motion simulator at Dollywood under the same name on June 12, 2009. It also featured in the new 4D Cinema at the Weston Super-Mare Grand Pier in the U.K. It was also shown in Movieworld on the Gold Coast. Journey to the Center of the Earth was released on DVD and Blu-ray on October 28, 2008, in standard 2-D format as well as a magenta / green anaglyph. It opened at #2 at the DVD sales chart, selling 843,224 units in the 1st week which translates to $13,238,617 in revenue. As per the latest figures, 1,642,994 DVD units have been sold, bringing in $25,346,260 in revenue. This doesn't include Blu-ray Disc sales / DVD rentals. The 2008 2-disc BD edition of the movie doesn't conform to the – only later established – Blu-ray 3D specifications, which means that this version doesn't take advantage of any dedicated 3D HDTVs, although it can be watched on 3D HDTVs, as well as on any other TV in anaglyph 3D, by using red-cyan paper glasses (four pairs are included). A 3D Blu-ray version was released on January 17, 2012. The film received mixed to positive reviews. It received a 61% approval rating by Rotten Tomatoes, based on 158 reviews with an average rating of 6/10. The website's critical consensus reads, "Modern visuals and an old fashioned storyline make this family adventure/comedy a fast-paced, kitschy ride." Metacritic gave the film a 57 out of 100, based on 35 reviews, indicating "mixed or average reviews." Roger Ebert gave the film 2 stars out of 4. Peter Travers gave it 2.5 stars and Owen Glieberman gave it a B-. Journey to the Center of the Earth grossed $101.7 million in the US and $139.2 million foreign sales, with a total of $242 million worldwide. The film opened at #3 in North America, behind Hellboy II: The Golden Army and Hancock. The film grossed $21,018,141 in 2,811 theaters in its first week of release with an average of $7,477. 57 percent of the opening gross was taken from theaters which showed the film in 3-D. In second weekend it dropped to $12,340,435 and in third to $9,717,217. 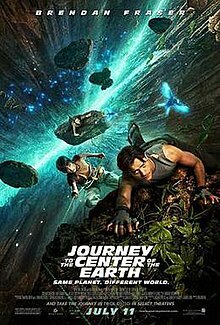 In March 2009, Walden Media announced a sequel to Journey to the Center of the Earth, Journey 2: The Mysterious Island, with Josh Hutcherson, Dwayne Johnson, Michael Caine, Luis Guzman, and Vanessa Hudgens. Jane Wheeler was replaced by Kristin Davis. Journey 2 was filmed between November 2010 and February 2011 and was released in February 2012. Like the first film, the sequel was shot in 3D, and the script is loosely based on a Verne novel – this time The Mysterious Island. Journey to the Center of the Earth 4-D Adventure is a 15-minute 4D film shown at various 4D theatres all over the world. It retells the condensed story of the film with the help of 3D projection and sensory effects, including moving seats, wind, mist and scents. Produced by SimEx-Iwerks, the 4D experience premiered in 2009. Locations included Warner Bros. Movie World (2010–2012), Dollywood (2009–2012), Enchanted Kingdom (2009–), Stone Mountain, and Rainbows End. ^ a b c d "Journey to the Center of the Earth (2008)". Box Office Mojo. Retrieved 2009-08-08. ^ Sunhee, Han (5 February 2010). "'Avatar' goes 4D in Korea | Variety". Variety. Retrieved 6 August 2013. ^ In Iceland Sigurbjörn Ásgeirsson's daughter would have the last name Sigurbjörnsdóttir, but in the film it is Ásgeirsson. ^ Journey 3-D Profile at Comingsoon.net. Retrieved March 14, 2007. ^ "Dolby Laboratories, Inc. - First Digital 3D Movie Released in China with Dolby 3D Digital Cinema System". Investor.dolby.com. Retrieved June 28, 2013. ^ "CI Professor inspires 'Journey 2: The Mysterious Island". Ventura County Star. 10 February 2012. Retrieved 13 October 2013. ^ a b Box Office Mojo: 'Hellboy II' Sizzles. Retrieved July 14, 2008. ^ Hollywood's 3-D kick hits a bump. Retrieved July 14, 2008. ^ "Best Atlanta Attractions - Atlanta Activities - Stone Mountain Park". www.stonemountainpark.com. ^ "Page Not Found". www.dollywood.com. ^ a b Journey to the Center of the Earth – DVD Sales. The Numbers. Retrieved 2010-11-01. ^ "Journey to the Center of the Earth (2008)". Rotten Tomatoes. Fandango Media. Retrieved May 14, 2018. ^ "Journey to the Center of the Earth Reviews". Metacritic. CBS Interactive. Retrieved May 14, 2018. ^ "Journey to the Center of the Earth 4-D". Iwerks Entertainment. Retrieved 6 December 2010. ^ "Journey To The Center Of The Earth 4-D Adventure (Warner Bros. Movie World)". Parkz. Retrieved 14 July 2013. ^ "Enchanted Kingdom's newest 4D adventure now showing". The Philippine Star. 26 April 2009. Retrieved 5 December 2010. This page was last edited on 31 March 2019, at 04:54 (UTC).